Have you grown tired of seeing the same endless rows of cubicles that occupy your entire office space? You can turn any office design you choose into reality and create a work environment that will benefit your employees and business for years on end with the help of our fit out company in London. Regardless if you need to modernise an old office or give your new commercial property a flying head start, Fantastic Handyman will always meet your demands on time and stay within your budget limitations. Just name the refurbishment services you need and your commercial renovation experts will gladly put them into practice. It doesn't matter if you wish to renew the floor coverings, install new office partition systems and glass partitions, or simply paint your ceiling or walls in matching colours – the fit out specialists will stop at nothing until every step of your office remodeling plan has been fulfilled. You will receive a detailed price estimation as soon as you book your service. There, we will list all refurbishment costs for each stage of your project – from labour to material and office partitioning costs, every bit of spending will be calculated down to the last digit. This way, you can rest assured knowing that you'll be getting your money's worth. The office renovation experts will diligently choose and deliver all materials that your project requires straight to your property. To give us a hint of what we need to shop for, simply share your layout ideas with us and we'll take care of the logistics for you! Even the most successful business is bound to fall as soon as its cogs stop turning for even one minute. 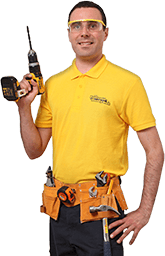 The experienced Fantastic Handyman professionals know that well and will implement all improvements very quickly and without getting in the way of your employees' daily work routine. Once they're done with your commercial refurbishment, the team will tidy up the place to ensure that no mess is left behind.